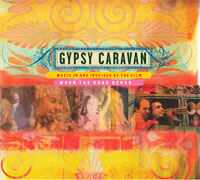 A letter written by Johnny Depp appears in the liner notes of the CD Gypsy Caravan. The music is from the 2006 film documentary When the Road Bends . . . tales of a Gypsy Caravan. 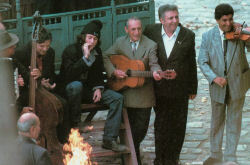 Johnny makes a cameo appearance in the film, praising the Romanian string band Taraf de Haidouks. “Negative stereotypes run deep. I’ve heard dozens of Romani American parents tell their kids not to admit to being ‘Gypsy’ at school because they’ll get kicked out of class. An exception was George Eli (the Romani man who recorded sound in my film and is now making his own film). George has two sons who he hoped wouldn’t mind telling their school that they were ‘Gypsy.’ But his younger boy told him it would be crazy—the teacher and other kids would assume that he was a pickpocket or that he was evil like the Gypsy in the film of Nôtre Dame. “When I went to interview Johnny Depp, I carried a short letter from George about his sons and their inability to be proud of being Gypsy. George wanted an autograph for them from one of the few Hollywood stars who seems to know about the Romani people and support them, without playing into the clichéd stereotypes of a Gypsy. I have recently been in contact with a young filmmaker, named Jasmine Dellal, who is working on what promises to be an extraordinary film, called Caravan. The film’s subject is Romany music and culture—which is a fascinating ethos. She interviewed me for the film, mainly because about six years ago I had the honour of working with an amazing group of musicians from Romania, “The Taraf de Haidouks.” We did a film together called The Man Who Cried in which I portrayed a Rom/Gypsy—The Taraf played my family. While working on the film together we developed a very close relationship and became great friends. We are still very close to this day—even if we’re not able to see one another all the time. This incredible group of men shared with me some of their most beautiful and poignant memories of growing up Rom, of growing up Gypsy, and though I know that it was not always easy for some of them, as the racism and the vicious, ignorant blind persecution of these amazing peoples was, and still is, prominent throughout the world, their ability and strength to smile through it and continue their march forward with great pride and dignity is a lesson and a gift from them to me that I will cherish always and forever. In fact, one of the proudest moments of my life was when they had decided between themselves that I was not just a Gadjo actor, or just another Gadjo person who would use them until I was finished with them and move on—no, they had decided to honour me with the title of “Prahl,” Brother. That was a defining moment for someone like me who has, in many ways, spent the majority of his life not wanting “acceptance” into the popular cliques, or groups—that welcoming into the world and family of the Tarafs meant, and still means, everything to me. Your father sent me a very nice letter to thank me for my involvement in Caravan. He mentioned that maybe my participation could be helpful for some Roma people, who are, in certain situations, ashamed of their heritage. I am not sure that anything that I have to say about anything can help anyone—but I certainly hope so. If I can help even one or two people—great!!! We should all be proud of who we are, where we come from and what we can make of ourselves. In closing, I guess what I’m saying is just that. Be proud of your blood, your heritage. Be proud and be strong—you, your family and your future are worth it!!! I hope this letter finds you both happy, healthy and strong.